Sustainable water supply is critical to the semiarid western U.S. In Wyoming, mountainous watersheds receive approximately 60% of annual precipitation and are sources for much of the downstream water supplies. 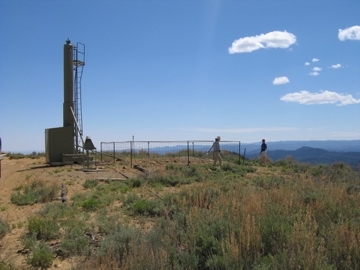 Groundwater in mountains, however, is poorly known due to lack of characterization and monitoring data. Funded by NSF EPSCoR and Wyoming Water Development Commission, we drill, test, monitor, and characterize an interconnected hydrological system centered at Laramie Range, Wyoming, and its mountain front areas: [Map] (1) Casper aquifer in Laramie Basin receiving runoff from the western Range; (2) Blair Wallis Fractured Rock Research Well Field in the Range; (3) Casper aquifer in Denver Basin receiving runoff from the eastern Range. 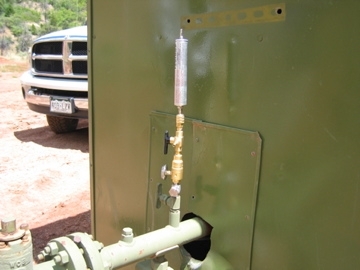 At these sites, we monitor water level and temperature of streams and bedrock wells. At Blair Wallis, we conduct hydraulic well tests at a variety of scales and work on joint analysis of hydrological and geophysical measurements to ''look into the subsurface''. Our aim is to improve water balance estimation for both headwater and downstream regions facing climate change and hydrological variability. 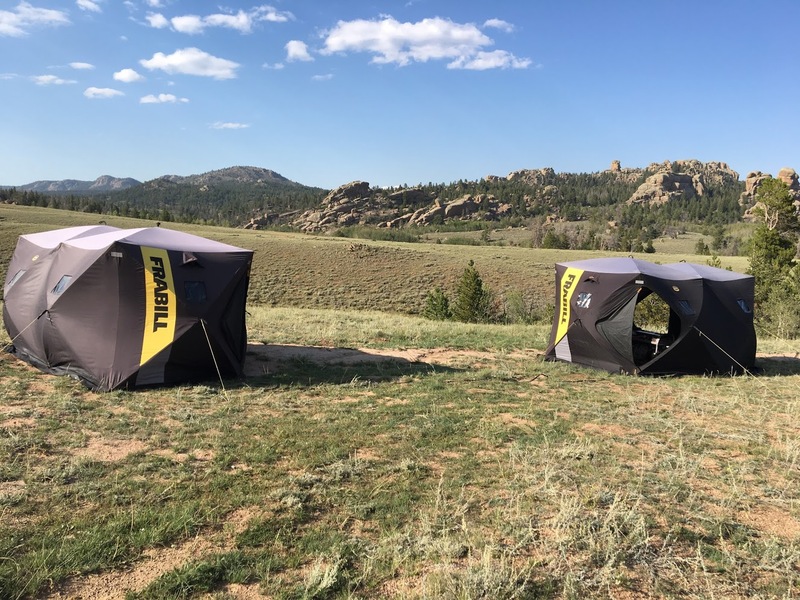 * Buford, WY: Blair Wallis Fractured Rock Research Well Field: We investigate fractures and their impact on subsurface flow and transport in the Laramie Range [Site Info]. [Research Overview]. [2015 Well Tests]. [2016 Well Tests]. [2017 - Slug Tests]. [2017 - Pumping Tests]. [Video: Drilling BW6]. [Video: FLUTe]. [Video: BW7 Test]. [Pic: BW7 Test/Start]. [Pic: BW7 Test/Steady]. [Video: BW8 Test]. 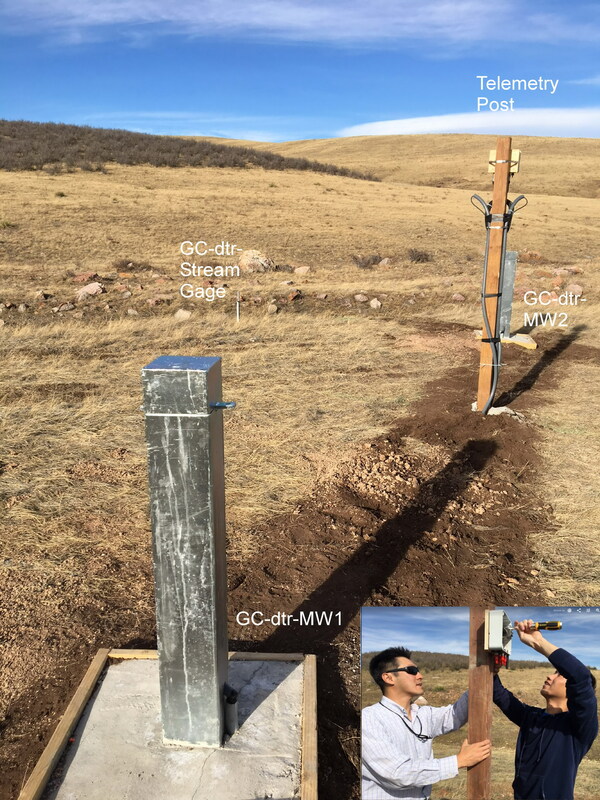 * Laramie, WY: Casper aquifer west of Laramie Range: We drilled and instrumented 2 multilevel monitoring wells in the Casper Aquifer, Fountain Fm., and basement fractured granite (same bedrock as in Blair Wallis) in the Government Gulch Watershed. Data will help illucidate the mechanism (timing, magnitude, pathway) of mountain front recharge to basin fill aquifers. [Map] [Video]. [Summary]. 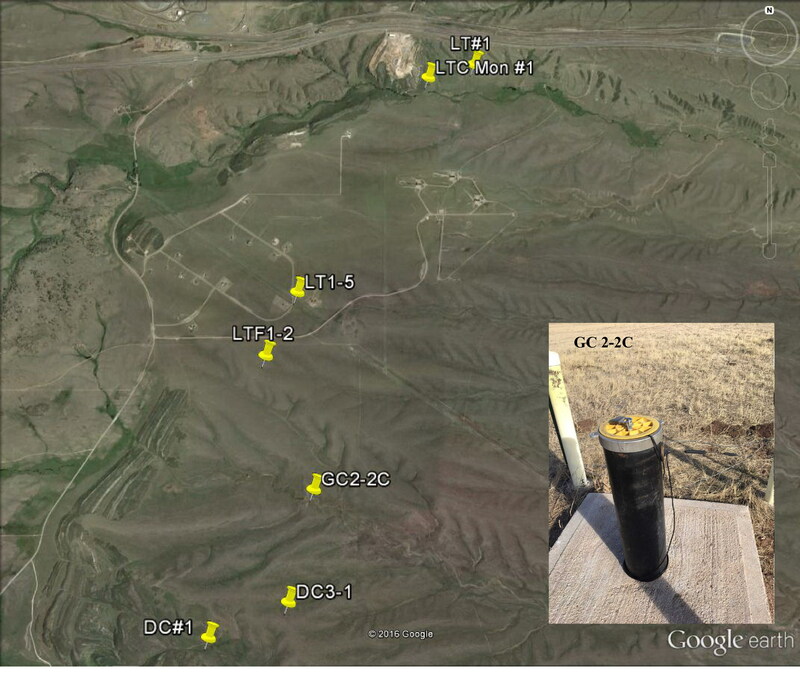 * Cheyenne, WY: Casper aquifer east of Laramie Range: We drilled 1 and instrumented 7 Casper Aquifer wells in Belvoir Ranch. Water level and temperature data are sent via telemetry. [Map]. [Drilling LTM No.1] [HydroVu]. 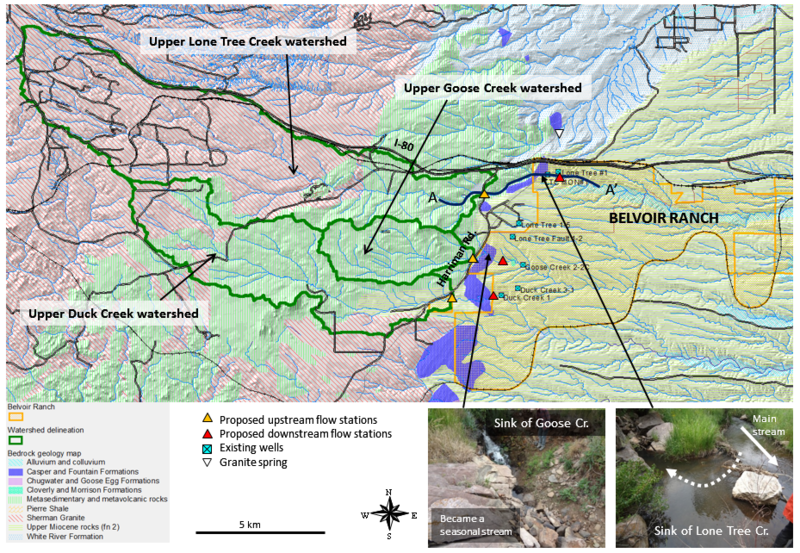 To further understand partitioning between streams, riparian groundwater, and bedrock groundwater at the mountain front, we've instrumented 6 stream sites along Lone Tree Creek, Goose Creek, and Duck Creek that recharge the Casper Aquifer at the Ranch. At each stream site, we've drilled 2 riparian wells. Thus, stream, riparian, and bedrock groundwater levels are simutaneoulsly monitored. [Map]. [Video1]. [Video2]. [Well summary]. [Pic: Goose Creek Downstream Site]. Wyoming is one of the leading energy-producing states in the country with the highest per-capita CO2 emission. Carbon sequestration and enhanced oil recovery (EOR) have been proposed at many geological storage sites in the state's sedimentary basins. 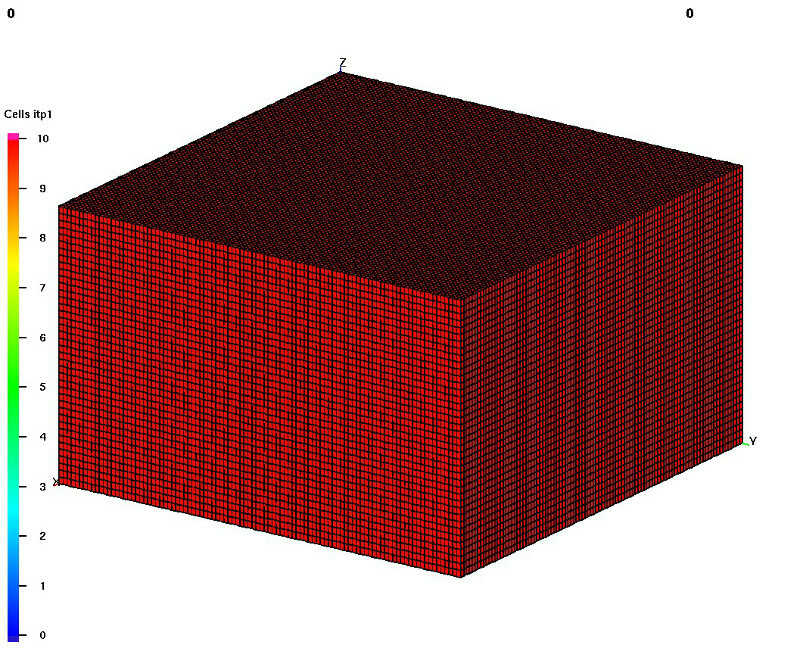 Our objective is to understand and reduce model uncertainty in simulating CO2 flow in geological formations characterized by sparse field and laboratory data. 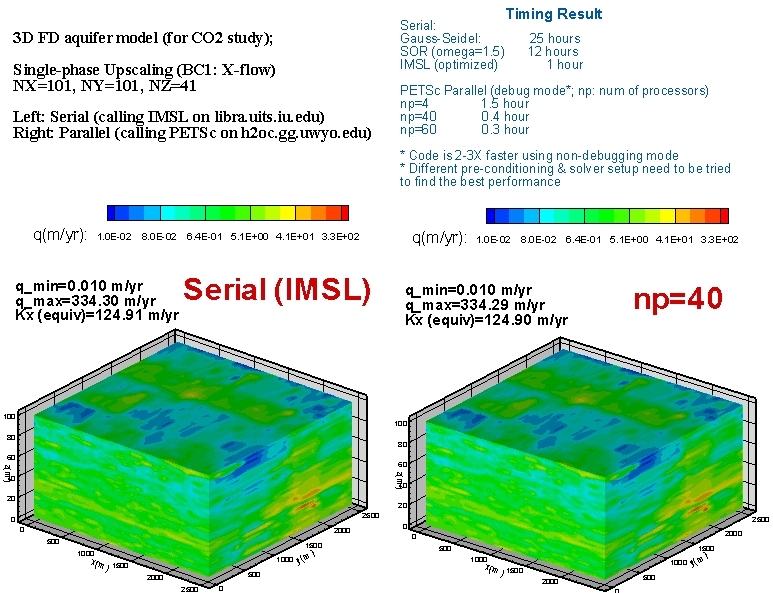 By integrating parameter upscaling and uncertainty analysis, we aim to (1) identify the most influential factor(s) that control CO2 storage and leakage; (2) evaluate conceptual model uncertainty in developing heterogeneous site models; (3) develop computationally efficient analytical proxy models to replace reservoir simulation; (4) conduct history matching to enhance model's predictive capability. Our long-term goal is to provide guidance to reduce the predictive uncertainty in modeling field-scale sequestrations in an efficient and cost-effective manner. 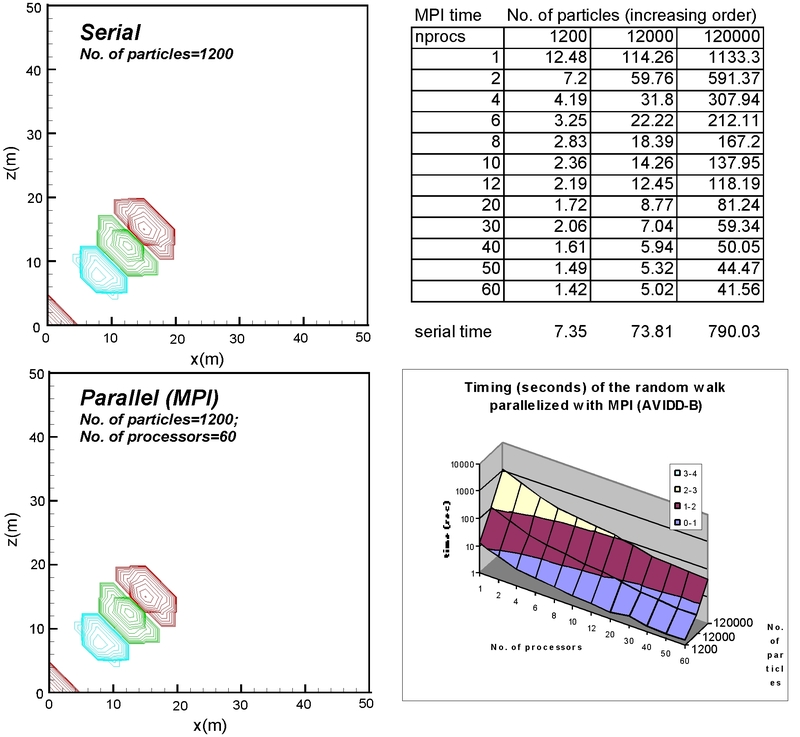 Below is CO2 simulation result in synthetic systems within a sedimentary hierarchy, showing the total gas-phase saturation (mobile + trapped) evolution over time (NSF EAR-0838250 and PRF 48773-DNI 8). A regional reservoir model in western Wyoming with significant dipping structure. This site is proposed for acid gas disposal from an oil industry's gas plant. We have extended the upscaling analysis to irregular (corner point) grids with significant dips. 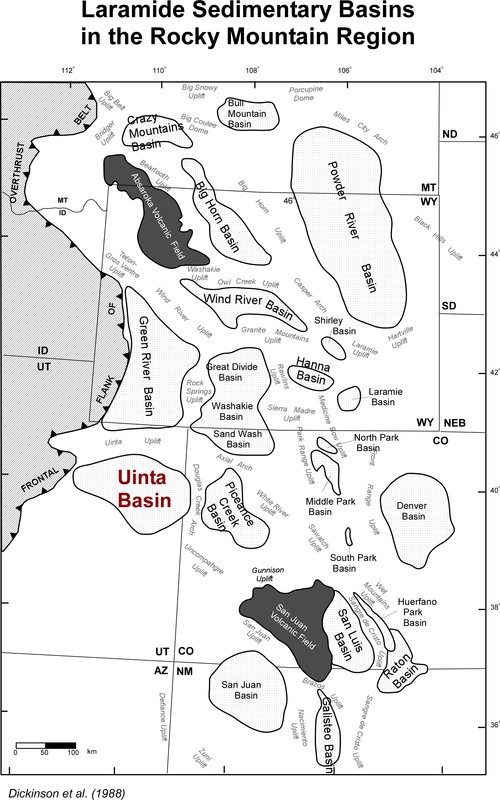 Sedimentary basins are host to important natural resources (oil, gas, water). In the arid west, increasing attention focuses on the availability of freshwater and how to protect this limited resource. In the Rocky Mountain region, a significant problem is the salinization of rivers and groundwaters. Where does the salt come from? 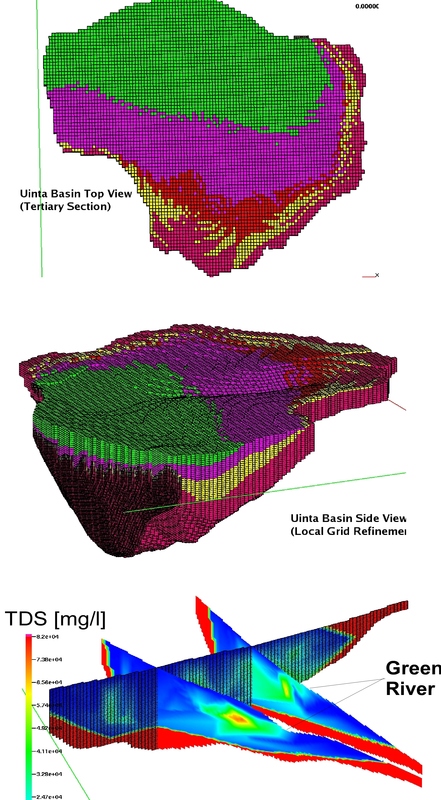 A 3D basin-scale model was built for the Uinta Basin in Utah, onto which existing water chemistry (~860 USGS TDS data) is projected (below the third plot). Regional scale upconing of saline water from 1~3 km depth is observed beneath the Green River. The research objective is to understand the driving forces (e.g., natural recharge, mineral dissolution, hydrocarbon production) behind such regional saline fluid migration and to predict the salt fluxes to surface waters using a combination of modeling and field measurements. Future work: (1) shale gas development on regional hydrology and salinization; (2) the impact of climate change on the plumbing and salinization of the intermountane basins. In the Rocky Mountain region, the development of tight gas reservoirs from sedimentary basins is accelerating. However, both the nature, extent, and flow characteristics of these gas deposits are poorly understood. 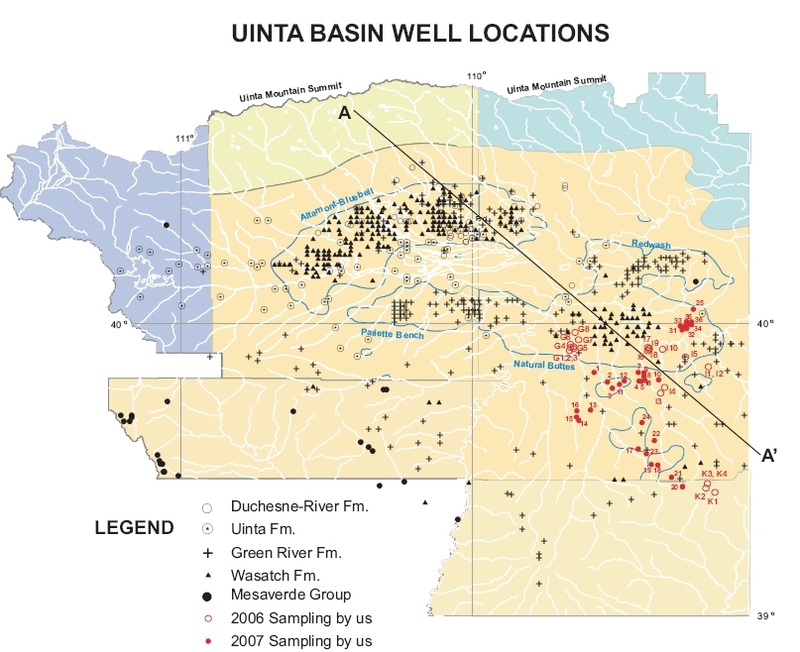 A second project will use combined water/gas geochemistry and numerical modeling to study the distribution, connectedness and subsurface heterogeneity of tight-gas reservoirs. The second plot (seen below) shows the location of gas wells we've sampled with perforation depth ranging from 4700 to 15000 ft. Along with ~300 gas data provided by energy companies, gas composition can be plotted and its migration studied at the regional scale. 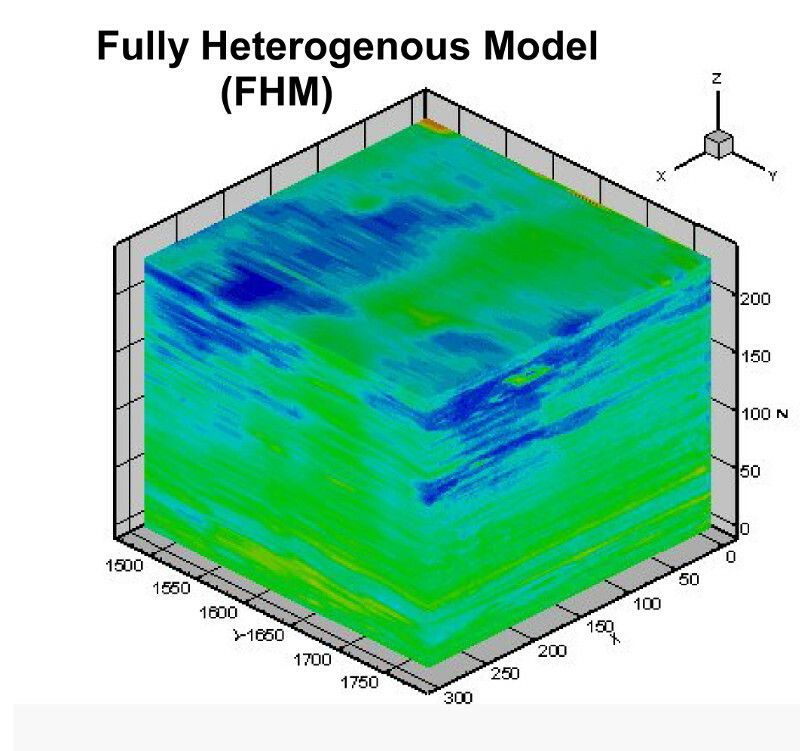 Uncertainties in modeling subsurface fluid flow and solute transport can be significantly reduced if the hydraulic conductivity (or permeability) heterogeneity is fully resolved. A set of deposits created in the Experimental EarthScape Facility, San Anthony Falls Hydraulic Lab, University of Minnesota, provides a unique opportunity to understand the impact of heterogeneity on flow/transport, and the impact of using effective parameters (effective conductivity, macrodispersivity) to represent the "missing" or unresolved heterogeneity on model predictions (see Zhang et al., 2005, 2006, 2007, 2008 for details). 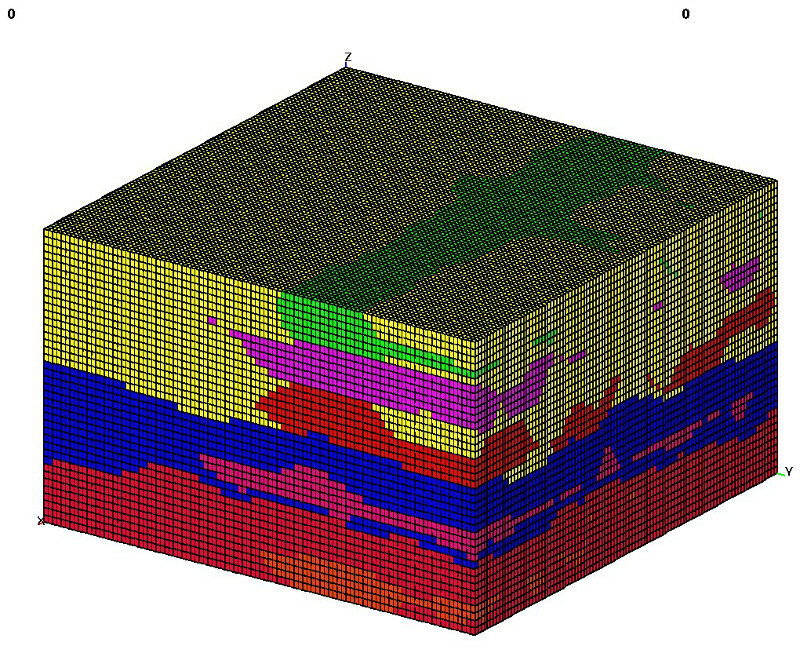 Based on the stratigraphic data, new research will explore the impact of three-dimensional heterogeneity on flow/transport (see below; a cutaway reveals the internal sedimentary structure which controls permeability heterogeneity). Changes in the prediction envelope and model sensitivity due to effective parameterizations in the upscaled models is assessed via the Design of Experiment (Milliken et al., 2007). A current project aims to understand the equivalent hydraulic conductivity (or permeability) at multiple scales, using geological mapping, percolation analysis, and numerical upscaling (see JPEG). 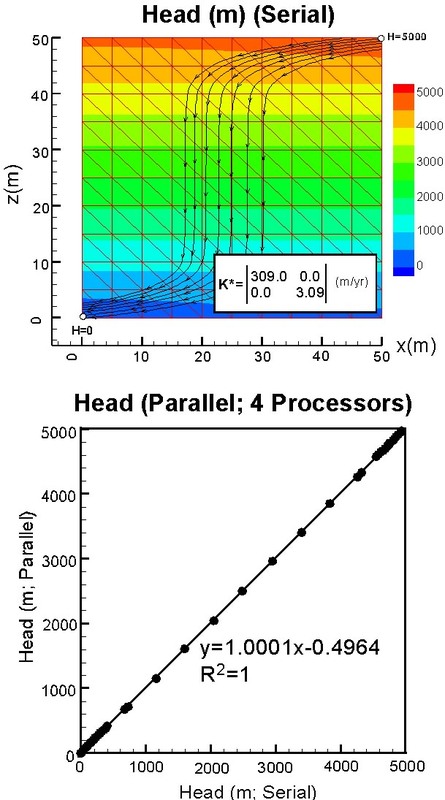 Starting with a heterogeneous aquifer (upper left), we can model the aquifer with (A), a formation-scale model, or (B), a facies-scale model ( model (B) is hierarchical to model (A); (C) is the top 3 channel facies of (B) ). Or, we can model the aquifer with significant high-K connectivity, based on results of a percolation cluster analysis (bottom row). 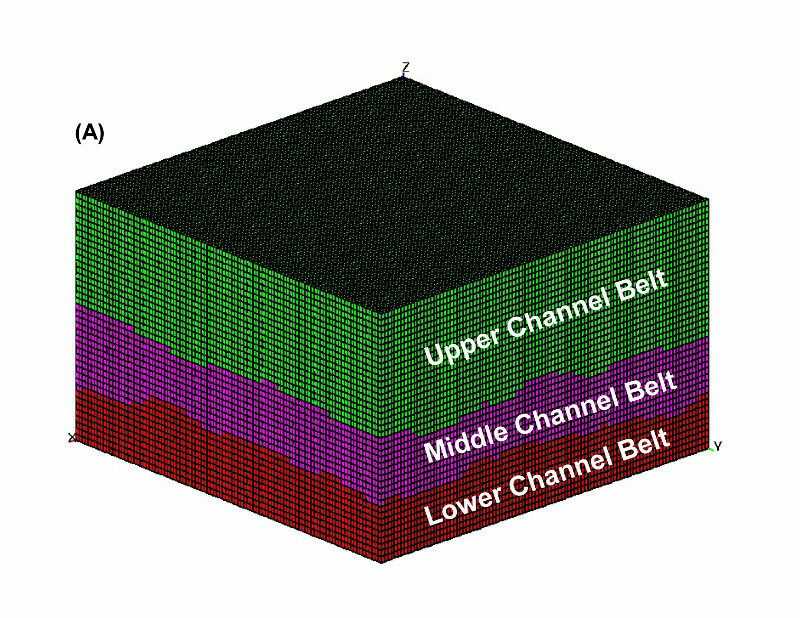 Equivalent conductivity upscaled for various geological units or domains can be compared to inverse modeling estimates of optimized conductivities. The issue of model complexity (i.e., finding an optimal geological characterization level which is linked to the cost of a modeling study) can further be studied (see JPEG ). Parallel computing has entered many science and engineering fields where large-scale problems can no longer be solved efficiently with serial computers/algorithms. To improve code efficiency, I've written parallel programs to solve for both flow and transport by calling the MPI and other libraries, e.g., AZTEC. Large problems can be solved within a fraction of the serial time. Below are results from small test cases. 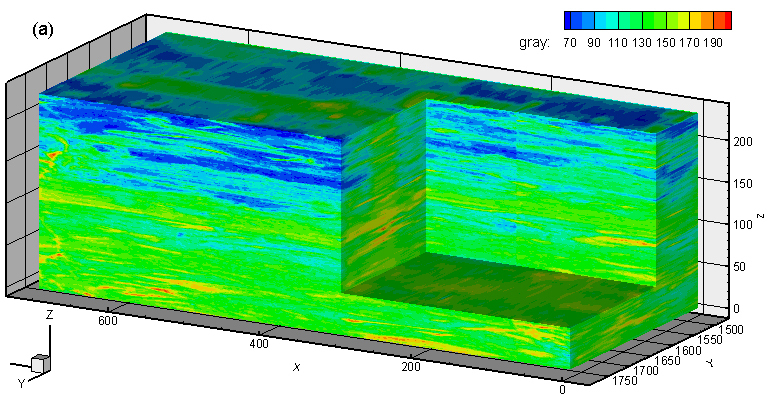 Left: Steady-state single-phase incompressible flow, solved with serial and parallel FE codes (mesh partition is done by Metis); Middle: Random walk particle tracking. Recently, a 3D fully heterogenous flow equation is solved by a FD code calling both MPI and PETSc (Right). See timing results and velocity fields. In the future, I will explore alternative and more efficient approaches, e.g., DA object which divides the domain into blocks (xs,xe,ys,ye,zs,ze) rather than nnode/np, and, parallel multigrid solver.